Young Muslims are learning how to become "peace agents"
In the late 1940s, it brokered meetings between those who had been on opposite sides in World War II. Now its headquarters, high above Lake Geneva, is hosting a group of young Muslims for the first time, as they consider how to work as "peace agents" within their communities. The organisers admit some unease within their own inter-faith peace movement about targeting a conference specifically at Muslims. But conference convener Peter Riddell believes that all those living in Europe need to address tough questions about how Islam relates to their shared future. "We're faced with a need to redefine what it means to be European. In many ways you could say that European culture has defined itself in opposition to Islam," he said. "So now the challenge is, whether we're going to embrace a European culture which includes a substantial component of Muslims, or whether we're going to reject that." The delegates - from countries including France, the UK and Sweden - bring with them stories of how different European countries deal with their Muslim minorities. Participants from France speak of the controversy over how Muslim women cover their head; British delegates discuss their irritation at the frequent popular association of Islam with terrorism. The main Muslim speaker at the event, Ajmal Masroor, says that the conference is about exploring the connections between faith and European identity. "We're finding a common thread that binds them. Every one of them is very happy to be a European citizen - a citizen of their own country - but to remain a good and loyal Muslim." 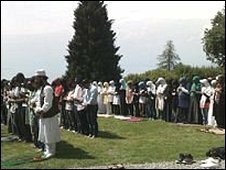 As participants sit on a lawn overlooking Lake Geneva following a time of prayer, Mr Masroor tells them that they should be confident about engaging in charitable or political work in their local communities. "Go back and revive and reclaim the culture of peace which has been the foundation of our faith," he tells them. The conference involves various sessions designed to equip participants with skills for promoting peace - both in their everyday relationships and at a community level. During one debate, delegates were encouraged to consider all points of view in some of the arguments about what constitutes European identity. Discussing the freedoms afforded to Muslim women, and the compatibility of democracy and Islam, they explored areas of tension between some interpretations of Islam and prevailing European attitudes. One session, on the search for inner peace, saw delegates sitting in a circle and being invited to share with others their own personal barriers to living a peaceful life. This combination of orthodox Islamic teaching and multi-faith spirituality is an unusual mix - but it is one the organisers believe reflects the complex European society in which these young Muslims live. The final days of the conference give the Muslim delegates a chance to try out their new-found skills with their European neighbours. They will join 150 other delegates, from other faith backgrounds and none, to consider how to promote peacemaking in today's world. The participants are determined that they have not simply been taking part in an idyllically-situated talking shop with no practical outcome. But the rise of far-right politics in some European countries demonstrates that Muslims have some way to go to persuade Europe's non-Muslim majority that Islam will contribute to a peaceful European future.